. . . my favorite people. I'm going to go "off" here for a minute so bear with me please. 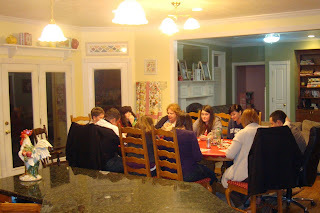 I have such a great support group of women in our circle of bloggers. I'm so happy to have such fabulous people to create with. The sweet comments, emails and thoughtful things said and done are a real blessing in my life. Just yesterday I got a simple comment with "xo" from Pam. Such a simple thing but I knew she visited me and was cheering me on. Her blog is so popular and is one of the first I ever visited. It is such a great inspiration to me. I got a card in the mail from Stephanie. She is so thoughtful. Stephanie designs and creates the greatest work (go look at the darling bag she just made). And last night I spoke on the phone with Terri. She helps me think straight sometimes and is such a patient friend. You are all so fabulous. Even those of you that read the blog and never comment. I know you are there and I appreciate you. Husbands are (usually) wonderful things and children are a blessing but let me tell you. The power of a visit from someone like you, and I mean YOU - whoever you are - means that you understand the creative process and appreciate the things I work on. I've said this before but I mean it so much. 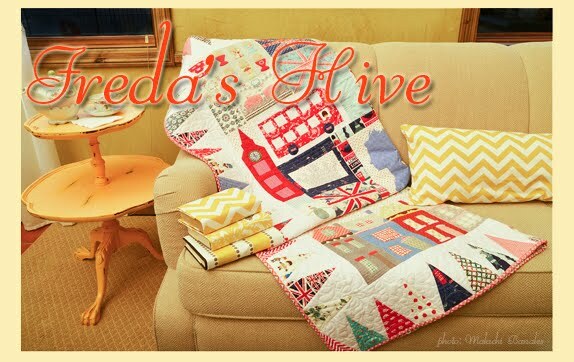 Blogging with creative women is like belonging to the best quilt guild in the world. Thank you! From time to time I get spoiled. I am always so grateful and so humbled by packages in the mail. You may know exactly how I feel. A few weeks before Christmas a lovely wrapped gift arrived and darn I didn't take a picture of it. I put it under my tree because it was so pretty. It was from Jodi. Jodi is one of the first bloggers I connected with a year or so ago. We are both very busy people but have similar interests and ideas. I left the package under the tree until Christmas morning because I enjoyed the anticipation of opening the package. 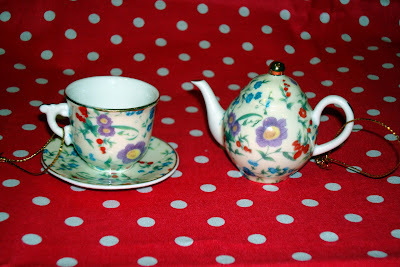 And this was inside - two very darling, and perfect for me, teacup and teapot ornaments. They went right on my Christmas tree. Jodi knows what I like. Thank you so much Jodi. They are really cute. And I'm not going to put them away with my other ornaments. They are too special to just bring out once a year and put on the tree. I placed them on a shelf in my sewing room where I can enjoy them everyday. Thank you. 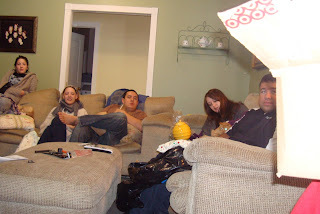 The Christmas Cottage Exchange brought me so many wonderful friends. I even made a new friend with Tricia. And she lives only a few minutes from me - but we didn't know eachother. She is terrific and I'm so happy that Terri and I did the exchange if just for connecting with the talented women we found. Mel is one of the sweet and incredibly talented girls that joined the exchange. And she doesn't live that far from me either - maybe an hour? I got to know Mel a little better when she had her cottage open house - what a clever idea. So today I opened my mailbox and found a little package from Mel. I of course ripped right into it before thinking to take a picture. But here are all the lovely prizes she sent me. A bow was tied around the bag with that sweet bird on the right. I know Mel made it and I'm hanging it right on my bulletin board next to Eileen's owls. 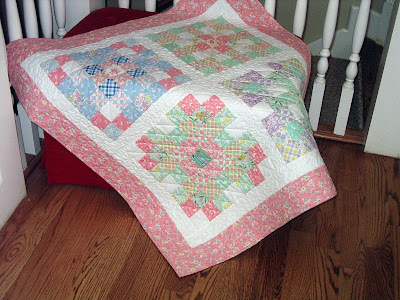 Mel included the pattern and charm square kit to make a beautiful table runner that she created. It really is such a neat idea and pattern. I've got to make that for next year. And then she included . . .
one of the door hangers she has been making. I saw them on her blog and thought how incredibly clever they were. Little did I know she made me one with an N on it. I hung it right on the door knob of my sewing room where I can see it everyday, too. Mel is such a precise sew-er. The last item in the package made me laugh so hard my husband had to come into the room and find out why I was laughing so much. Oh my gosh. The bag. I am telling you that the (female) principal of 5th and Spring, my elementary school, gave out "samples" similar to this bag after our very special movie when I was in 6th grade. I can still remember the girl in the very old film ("Mom, I think I'll take an extra shower today.) The bag is so incredibly hilarious. 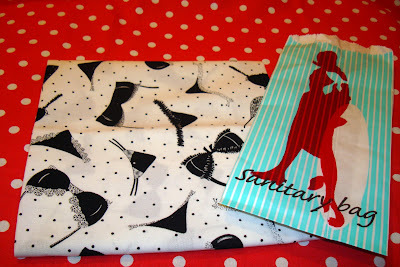 And inside the bag was this very fun novelty fabric. I'll have to make little zipper clutch and line it with this underwear fabric. Mel has the best sense of humor. Thank you so much. I'm very grateful to think I have so many women to connect with all over the world and in my own back yard, too. Instead of 'girls in white dresses with blue satin sashes' hum that tune from the Sound of Music as you look at my sweet Christmas gifts. Sorry it doesn't rhyme. 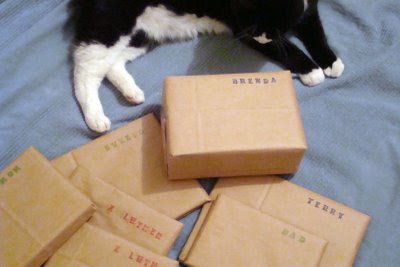 And there are more present gifts, some not easily photographed and some being washed (already used!). Plus some fabric that I will show Friday. My favorite things include my wonderful extended family and my very special friends. Thank you all. 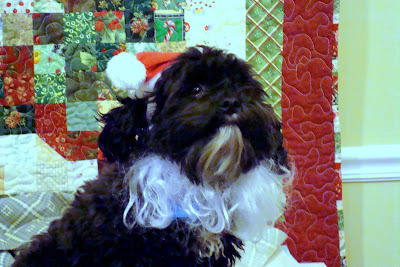 Merry Christmas to all the new friends I have made in the past year and to all my dear "old" friends and family. It is time to put aside my needle and thread and enjoy a few days with family and relaxation. I hope to catch up with the blogs I'm overdue on reading over the weekend and I'll be back Monday. 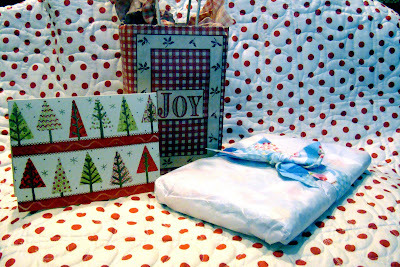 I have been pretty busy this past week - wrapping up the last minute things that need to get done before the holiday. A co-worker of mine has a crocheted stocking that his grandmother made him when he was a child. It is white, and has his name in green, and features a small train. This is a prized possession of his, that he now displays in his own home every Christmas. When he got married last her, he and his wife felt a little sad that he had a nice stocking that was made by his grandmother, and she didn't have one to match. So, this year, he asked me to make a stocking for his wife to match his. 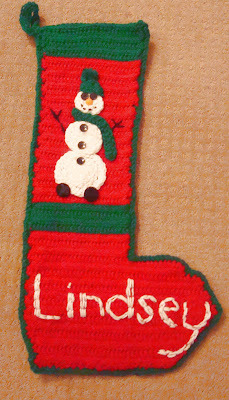 I didn't have a pattern, and I could only have a few days to look at the pattern - because he didn't want his wife to know that the stocking was missing - so I just took it, and took the best dimensions I could, and did my best to replicate a similar stocking for his wife. I hope he and his wife like it. Before I put the name on, I actually had a nightmare that he didn't remember how to spell her name, and I wasn't sure exactly how to proceed. I really hope that the both of them like it. The big day is almost here. Tomorrow I will just give up and stop sewing. I've still got lots of other things to do for the holidays but I can see the end in sight. And it will be fun to spend time with my family and close the door on the world for a few days. Natalie has been wrapping gifts and I really like her idea for wrapping. She went to the grocery store and asked for some brown bags. And then she used a stamp letter set and stamped the recipient's names on the top corner. Cute and I love the simplicity. There is Roy wanting to see what is going on. Roy is a cat that sneaks into our house every once in while. 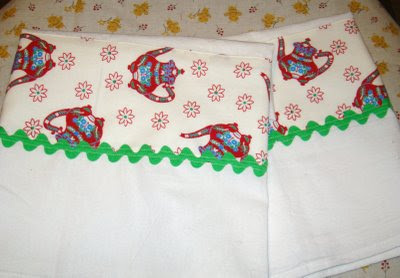 I did embellish several more kitchen towels. 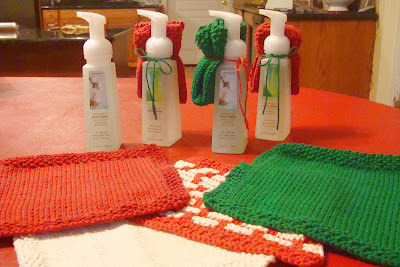 I have 4 more left to make but that will be the end of the towels for this year. 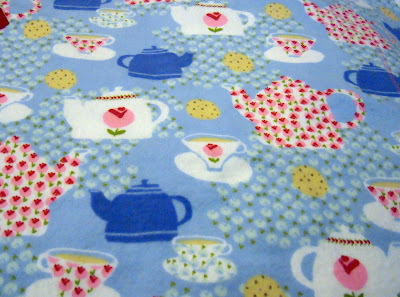 I went to Material Girls, a local quilt 'hot spot', on Saturday to get a bit of red check fabric for binding and spied this cute teapot fabric that had previously escaped my watchful eye. 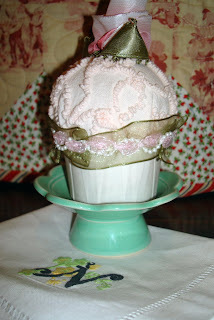 It is very vintage looking and when just embellishing, a little bit goes a long way. I wasn't sure about the white background on white towel but it is a clean look. I ran out of red rick rack so I substituted green. It pulls out the little bits of green in the fabric. I didn't have blue, so it's okay I hope. I think I made 12 house pot holders all together. These all have special homes to be mailed to after Christmas. 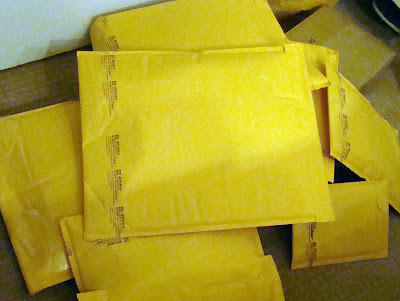 Your comments convinced me that I'm okay to send belated Christmas gifts out still. Thanks for that. I've taken some pictures while making them so I'll post a tutorial after Christmas since several of you asked. 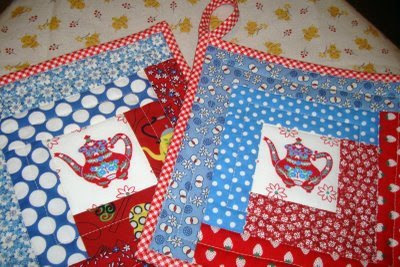 I used the same teapot fabric to finish up some scrappy potholders. I ran out of the insulated batting after making these so I suppose that means I am finished making pot holders for the year, too. 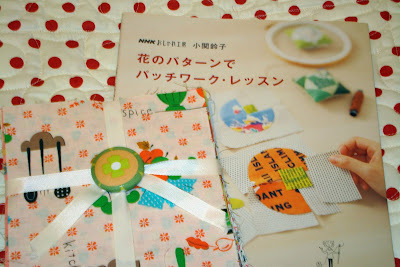 Using scraps makes me happy. I got the heat resistant batting online. I wonder if they have some at Joann's? 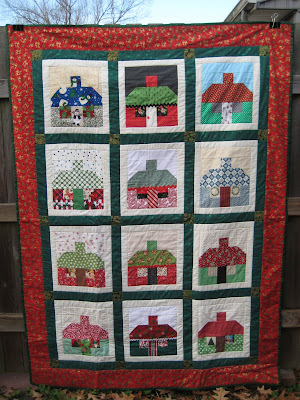 Chen, from our Christmas Cottage exchange sent pictures of her finished!!!! 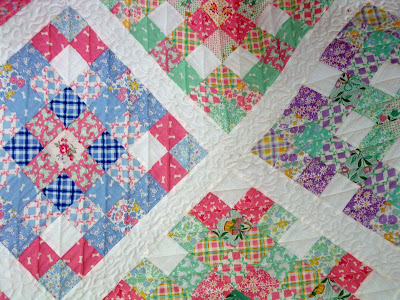 quilt to me. It is beautiful and fabulous! I love it. 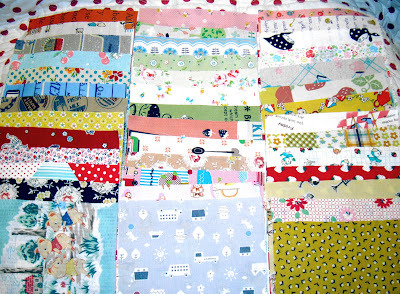 I can't tell you how satisfying it is to see these blocks set in a quilt that will be a memory for a long time. Chen did a wonderful job. Now look at Chen's label! What a great way to remember who made each block. Very clever Chen, I think I'll copy your idea. I've made labels like that before- printed from my computer. Thanks so much for sharing that with us Chen. 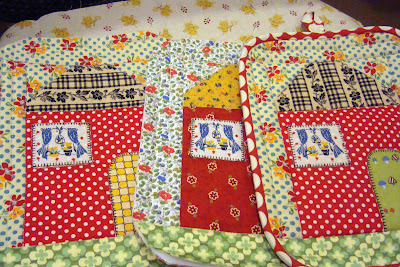 I'd love to post more finished cottage quilts as they get done - so send on the pictures. The scurrying continues at my house and your house, too, I'm sure. I hope the weather doesn't stop your plans. We had at least a foot of snow. Hope you are having a good day my friends. You know what I'm doing. This is how I figure it. I'll keep sewing right up until Christmas Eve. And what I do get done - I get done. And what I don't - I don't. Isn't that how you do it too? Or am I the only "last minute" holiday sewer? Sherri had this fabric for show-n-tell on her blog a couple months ago. And I really loved it. So I did a search for it online and found it on sale. I bought 2 yards and I've maybe got a scant 1/3 yard left. I've used it for several projects. And I really like it. The scale is perfect for so many uses. I had this thick cotton kitchen toweling yardage from a couple years ago that has stripes down the side and a finished edge on the sides. 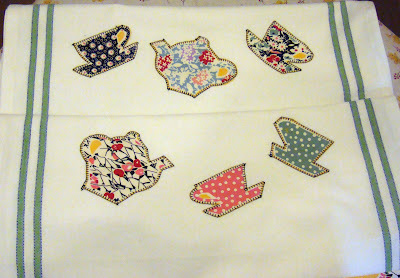 I cut it up into 4 pieces for 4 kitchen towels and then sewed cheater applique from my teapot/teacup fabric shown above. 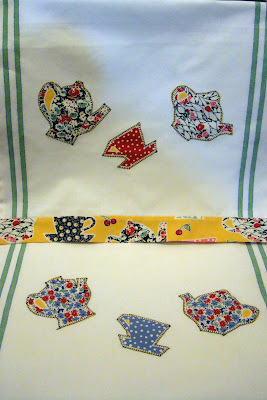 I just cut it out carefully leaving 1/8" around the teacups/teapots. I just used a blanket stitch on my machine. No fusible for me thank you - especially for towels. I won't vouch for how much washing they will stand but I'm giving them away so as long as they look pretty, I'm okay. 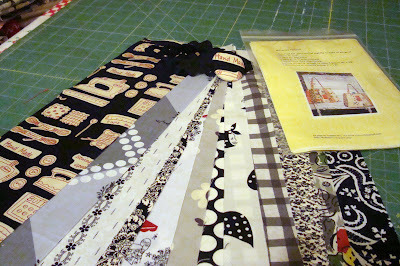 I used my used dryer sheets to stabilize the back while I appliqued and then tore it away when stitching was complete. I really love that technique - thank you again Bonnie Myles. I finished the raw ends with the same fabric. 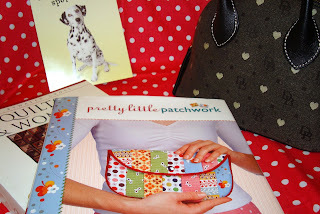 I sewed, pressed, turned and stitched in the ditch. They worked up pretty easy and somewhat quickly but I've run out of toweling now so I'll be back to the linen/cotton blend prints that I was working on before. I like them, too. I'm also making pot holders. I did use the special batting with reflective heat properties called Insul-Brite. I blogged about it here before. 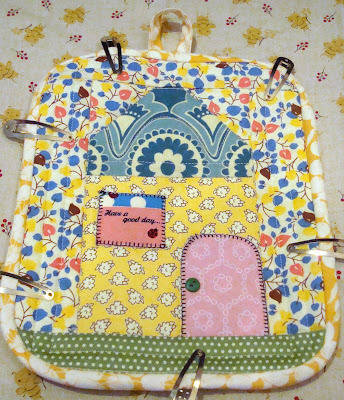 Not that I'm encouraging anyone to actually touch food or a hot dishes to my hot pads (that take so much time to make.) This one didn't turn out so great I think. There is too much going on. The background fabric blends into the house and it is hard to notice where the house ends and the leaves begin. Oh well. If I had it to do again I'd blanket stitch around the house and roof parts too, to give add definition. Back to cranking out gifts. It was fun to sew and listen/watch the Eagles win last night. Go Eagles. Sorry I'm not around visiting much these days but Santa is coming! Thank you everyone for playing along with our 1 year blog anniversary and coming everyday to celebrate with us. Everyone left thoughtful and sweet comments. It was fabulous to read them and enjoy the participation of both old and new readers. I know you hear people say "I wish everyone could win" but really - I do! I guess that is why we did a week of prizes so more people could would win. We had over 300 people participate. There is so much bad news this Christmas that I thought this would be a fun way to do something positive. First I have to tell you that my daughter Shelbie and I worked on this giveaway in a completely mathematical process. We made a spread sheet and put each commenter's name on the spread sheet and kept track of each day's comments. Extra points were given to those that came to the blog everyday and those that posted about the giveaway on their blog. We assigned each person a number(s) from 1-1615. So for instance, if you posted 5 days you got 5 numbers assigned to your name. It worked out perfectly - better than cutting up over a thousand comments and then making extra bits of papers with names for the extra points and pull out 7 winners out of a jar. We downloaded the random number generator and with the spreadsheet up on my computer and we let the number generator pick 7 winners. I know this may sound corny but I had butterflies when we ran the number generator. I was so excited to see who would win. But also sad knowing there would be 295 people that wouldn't be picked! Remember the first person gets their first pick of prizes and so on down to #6 and poor #7 gets what is left over - sorry. Below are the winners with one of their comments and timestamps next to them. 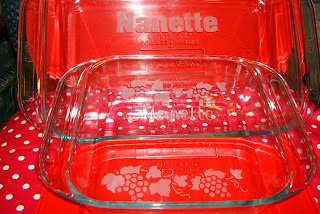 well nanette....it's been a 'wild' ride this week, but as the saying goes 'all good things must come to an end'.....i've gotten kind of used to this morning ritual of doing 'the fredas hive thang'......but, i felt right at home....i meander through your sewing room every morning anyway...so, this week just had a little more 'sparkle' than usual......love all the 'goodies' and have enjoyed everything you have shared with us......i'm just glad you're THE ONE who gets to sweep up after all this partying!! Congratulations on your first blog anniversary! 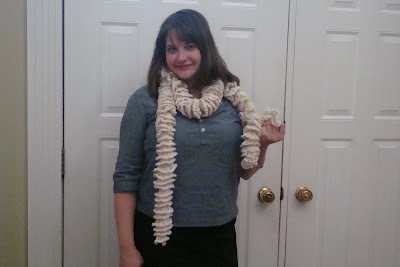 Just found your blog a couple of days ago, but I love it! Now to get myself a copy of that Fons and Porter magazine. I'll be posting your give-away on my blog. See you tomorrow. Happy bloggiversary to one of my favorite blogs!!!! 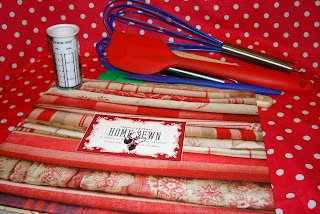 Great ideas for gift giving in your giveaways! How adorable are those! Thanks for sharing the link! I blogged about your party today on my blog. I'll e-mail you just so you'll know. 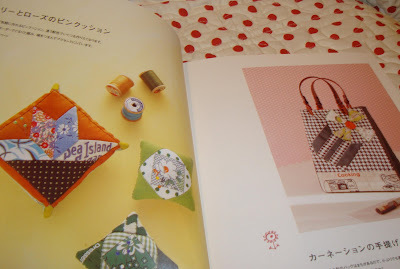 Wow a 40 pack of japanese fabric charms and a book to boot. Holy cow! Every day this week has been a amazing prize. Thank you for all of the fun!! Very cute dishtowels! Happy Day #3!!! Thanks again everyone. 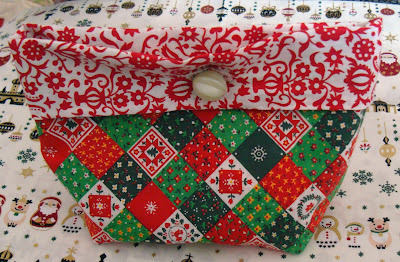 Christmas 10 days away and if you are like me you'll be sewing up until Santa time. I hope everyone is having a good weekend. It's supposed to snow all day Saturday here in Utah. So it is a good day to hunker down and sew. Today's little prize is a tote bag. 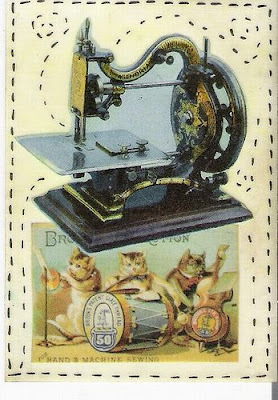 It is made with novelty and vintage fabric. 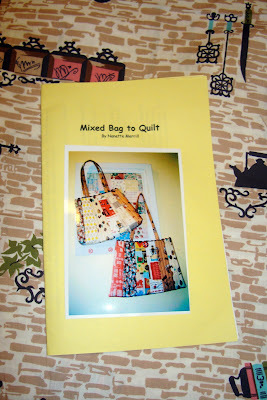 I made several of these bags and then decided the oval bottom was too darn hard to keep making so that is when I came up with my "Mixed Bag to Quilt" pattern. 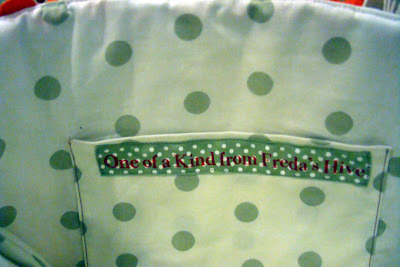 Lining is in green polka dot with a Freda's Hive label. I learned how to make linings fit a little better after making this bag so I will say as a disclaimer that the lining is somewhat large for the bag. But it is a prize so no complaining! Don't even ask! Nope, this picture above is not up for winning. Forget it. 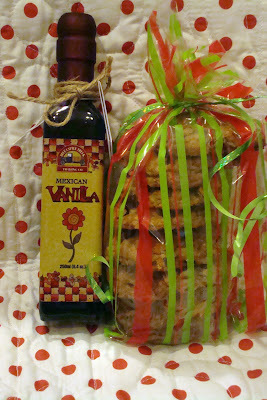 Last night my friend Flora brought me cookies and delicious smelling vanilla as a little care package. There is only one Flora and sorry, she's not a Freda's Hive giveaway prize either! These cookies rank right up there with best cookies ever. She told me she got the recipe at Pioneer Woman (who lives like the pioneer woman?- not me, isn't she is something else?). I can't think of a better cookie to take to friends at Christmas. Unless maybe it is peanut butter with a Hershey kiss. Love those, too. Happy Weekend. We are done here today. If you don't see me Monday you'll know I'm still counting comments ;-). Hello everyone. Your comments continue to delight, enlighten, and bury me! I am reading them all but I haven't quite found the time to comment back to everyone, but I know you will understand. This has been an insane week but incredibly fun. I am enjoying the party. So today is FFF, my regular Friday feature. 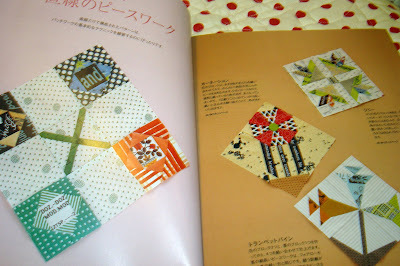 For today's featured giveaway I thought I would put together a charm square pack of some of my favorite fabrics from Japan. If you are a regular here you know I have a passion for vintage, novelty(especially kitchen) and just plain old "different" fabric. Here are 40 different 5" squares of Japanese import fabrics that represent some I've been collecting for years now. There is no common color or theme. They are all just fabric that I like. I've been asked where do I get my fabric. If I am looking for something very specific I usually go to Etsy.com first. I like buying from independent sources. They have a search feature and you can find just about anything there. 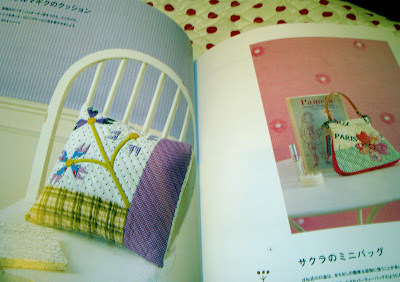 If I am just window shopping I search "Japanese fabric" in the supplies. I also have some other sources on my side bar. I'm sure most of you are familiar with those retailers. Of course the best deals are when they have sales. I rarely buy a large piece of fabric. I'd rather have smaller bits and more variety. 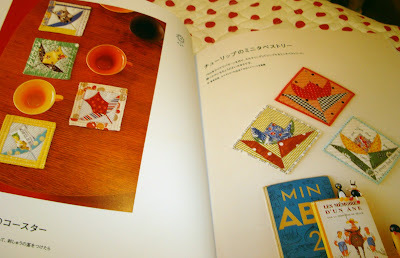 Along with the charm pack is a Japanese Patchwork book. And yes, the instructions are all in Japanese - but I learn from pictures anyway so I've been able to get over that obstacle. However, keep in mind they make things very tiny in these books so often I enlarge projects to suit me. Below are just a few of the highlights from the book. Click to enlarge (I hope). So people, you know what to do, leave a comment to enter for a chance to win today's little prize. Tomorrow is the last day. Next week I'll list the winners in order and they can choose their prizes in the order picked. Fun fun. I can hardly wait. You never know when a baby quilt might come in handy. I usually have several in reserve and since I enjoy making them so much it isn't a problem - I have at least a dozen. 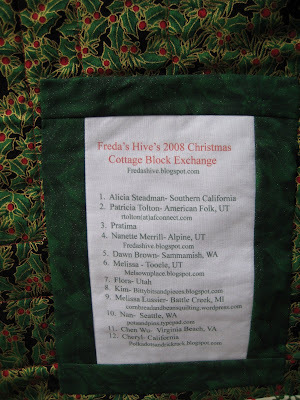 Go ahead and "Freda's Hive" today and if you get your name picked this baby girl quilt just might be something you will have delivered to your door - like it or not - if it is the last item standing. Welcome back to the Hive. Some of you have asked questions or made comments I would normally like to reply to - but several of you do not have email addresses attached to your profile/name listed with your comments. So next time you comment, if you haven't left me your email address, please do. If you win, that way I can get a hold of you. I'm still working my way through comments in no particular order. I can almost hear your voices as you remark and your many personalities come through to me. Thank you. Okay on to the "business" part of the post and then some fun show-n-tell. 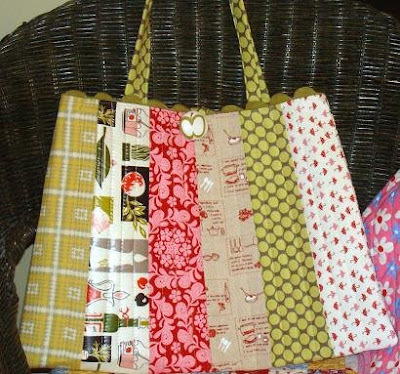 Today's prize up for grabs includes 4 Freda's Hive patterns and a kit to make a bag. The patterns are original designs. 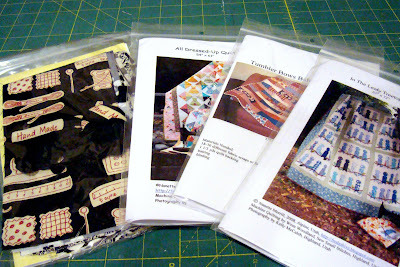 Three are for quilts. 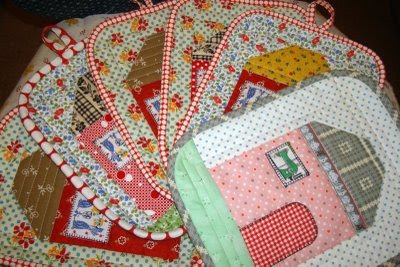 I figure if you don't make quilts or make bags, these might be a good gift for someone on your list, if you win this prize. Here is the pattern to make the bag included with the kit. In honor of the black and white challenge sponsored by Jackie, I had my black and white fabrics pulled so I made a black and white bag kit with a little bit of color thrown in. 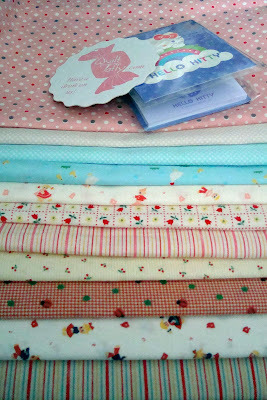 It is a fun mix of fabrics with some vintage, Japanese novelty and some just plain fun prints from my stash. The bag will look like this when it is done - except of course it will be black and white. The covered button and rick rack are included. You will have to furnish lining fabric and interfacing. 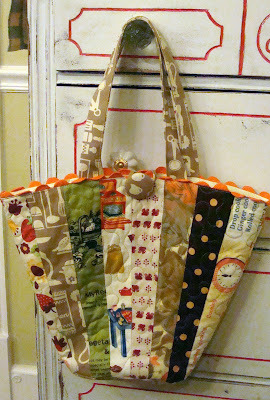 This bag has been my most successful pattern and I have made dozens of them myself. 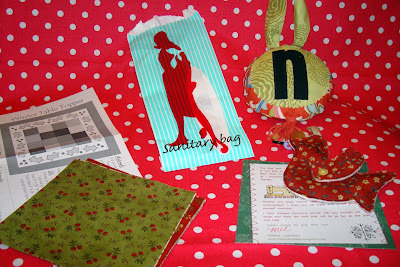 The fabulous Eileen at Eileen's Attic sent me a package last week. Part of it I left wrapped and put under my Christmas tree. I have a feeling it is vintage fabric but I don't want to spoil my own surprise! 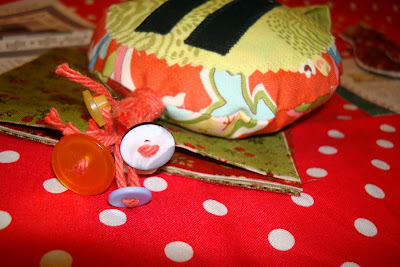 There was this sweet little basket/pouch/bag included made with the most wonderful vintage fabric and vintage button. 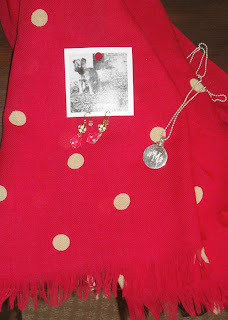 I'm a vintage girl at heart and Eileen knows what I like! And inside were these darling ornaments. 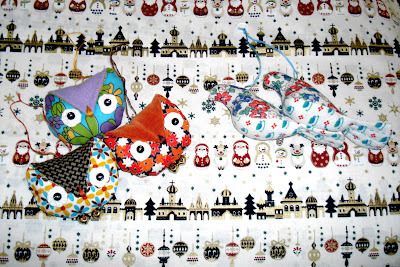 Two turtle doves, three cute owls, and I hung them immediately on my tree! (you could almost sing to that) Eileen's work is impeccable. She is meticulous and everything is done so well. 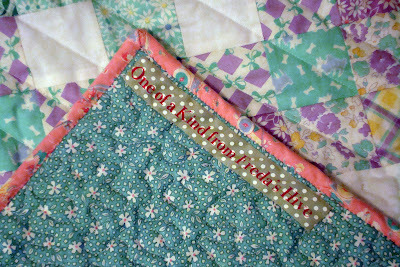 The fabric she used is vintage and absolutely wonderful. Look at the little tiny cups and saucers on the breast of the turtle doves. 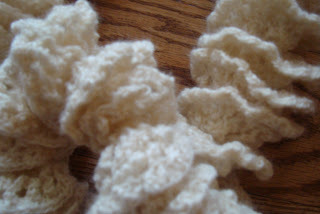 I love the textured fabric she used on the V of the owls and the tiny tiny yo yos for the whites of the eyes. Go ahead, click the picture. It is worth it. Can you see the little tiny bells she used for feet??? So clever. You can see in my blog header they are on my tree. But these ornaments will not go into the closet when Christmas comes down. 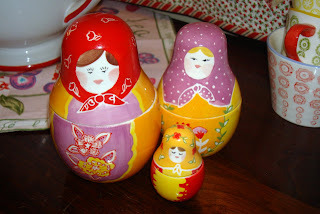 They will go in my sewing room along with Terri's angel. I'll find a cute spot to display them. Thank you Eileen. You are a dear friend. Stephanie of Loft Creations is also a dear friend. She knows me well judging from the package of fun that arrived yesterday. It was packaged so sweetly I hated (almost) to open it up. Inside the tissue paper was the softest, cute pillow case. Stephanie is famous for her pillow cases, among other creations. 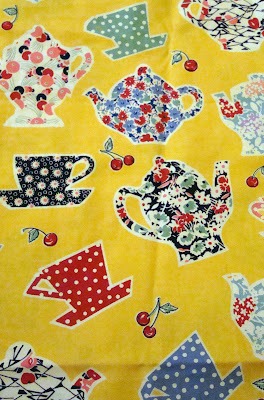 I am a kitchen fabric/teapot/dishes lover. And the pillow case suits me perfectly. The first thing I did was have my daughter run up to my room to grab my pillow to put inside. So so soft. And then the rest of the goodies - yummy candy from Ohio (might cause trouble in my house because of it saying Ohio State Buckeyes so I'll have to eat it myself! 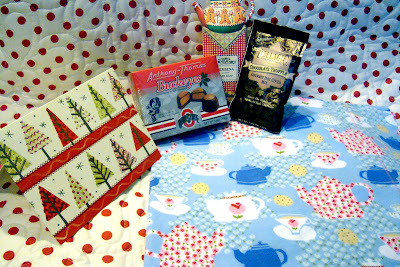 ), Mary Englebreit soap, and hot chocolate mix. Truly a custom picked package for me. I don't know how Stephanie knew that I love Verbena/lemon. It is my absolute favorite scent. I look for lemon scented everything. 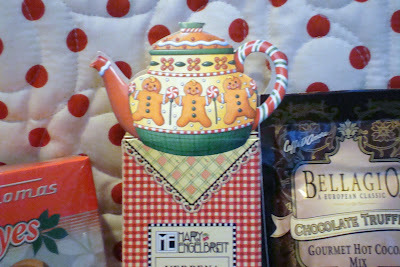 And the top has this cute gingerbread teapot. Don't you just love ME items. I will save the box most definitely. The last item made me smile and appreciate Stephanie all the more. It is a little thing, but it means a lot to me. 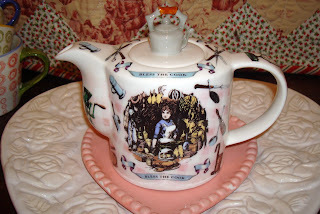 A while ago I mentioned to Stephanie my love of teapots but I told her I don't drink tea. I also told her I love hot chocolate. And of course she remembered. Now that is a friend. Thank you Stephanie. Both of these great girls are very special women. The best part of blogging is getting to know people all over the world that share my interests. I would never get to make these friendships without Freda's Hive. Thanks to everyone for playing along with my little blog anniversary this week. See ya tomorrow!